I have never been a fan of XTC. About the only song of theirs I really do like is “Dear God“. The Dukes of Stratosphear is a different story. The Dukes of Stratosphear is XTC paying homage to 1960’s rock bands like The Beatles, Pink Floyd, The Beach Boys and The Kinks. If XTC had sounded like this, I would have listened to them a lot more. “Chips From The Chocolate Fireball” is a compilation of their first min-album “25 O’Clock” and their album “Psonic Psunspot”. They channel The Beatles with tracks like “The Mole From The Ministry” and “You’re A Good Man Albert Brown“. “The Mole From The Ministry” has an upbeat rock sound with clean vocals, pianos and guitars. Buried in the music however are distorted vocals, background chatter and other noises. “You’re A Goodman Albert Brown” has little psychedelic weirdness, but the song swings like a pub song, with some great piano and vocal work. On a few tracks, they drop the weird psychedelics as they channel bands like The Beach Boys. With “Vanishing Girl” they create a more straight forward early ’60s rock sound. The song has a slight surfer guitar edge, with harmonizing vocals during the chorus. For “My Love Explodes” they speed up tempo, throw in some deep bass, a little sludge and some straight forward Hendrix like guitar work. With tracks like “25 O’Clock” they head into Jefferson Airplane territory. The song moves align with low key vocals, bass lines that hypnotize and then rocks out when the chorus hits then it all comes crashing at the end. That is one of the great things about “Chips From The Chocolate Fireball“. 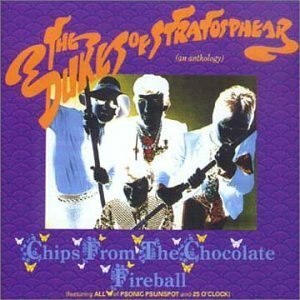 The entire album stays interesting because The Dukes Of Stratosphear change things up so much. If you are a fan of ’60s rock, even if you don’t care for XTC (as XTC) you should check out The Dukes OF Stratosphear. I think you’ll dig it.